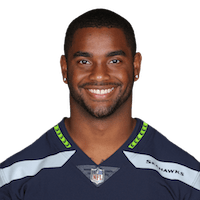 The Seahawks didn't tender Madden a contract for 2019 on Wednesday, making him an unrestricted free agent, John Boyle of the team's official site reports. Analysis: Madden rushed three times for three yards across 14 games with the Seahawks last season, instead seeing most of his action as a lead blocker. 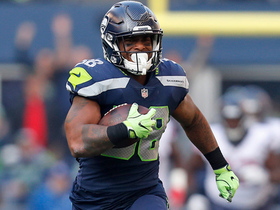 The 25-year-old sat out Seattle's wild-card playoff loss against the Cowboys due to a hamstring injury but should be fully healthy as he hits the open market. Madden (hamstring) was ruled out for Saturday's wild-card game at Dallas. Analysis: Madden was listed as doubtful with the hamstring issue, so his absence was to be expected. The Seahawks will go without a true fullback Saturday, but could utilize tight ends Nick Vannett and Ed Dickson as blockers out of the backfield, if necessary. Madden (hamstring) is doubtful for Saturday's wild-card game against the Cowboys, Gregg Bell of The Tacoma News Tribune reports. 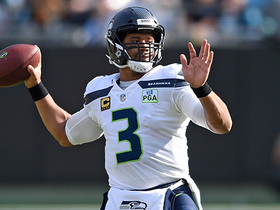 Analysis: Madden is nursing a hamstring injury and appears on track to sit out Seattle's playoff opener. If the fullback is unable to suit up, tight ends Nick Vannett and Ed Dickson could see increased usage as blockers. Madden (chest) is inactive for Monday's game against the Vikings. Analysis: Despite practicing in full on Friday, Madden will miss his second straight game with a sternum injury. The fullback is not a stat producer on offense, as he has only three rushes and two catches all season, but the Seahawks could use tight ends Nick Vannett and Ed Dickson to fill Madden's role as a blocker. Madden (chest) is listed as questionable for Monday's game against Minnesota, John Boyle of the Seahawks' official site reports. Analysis: Madden appeared to be clear of the chest injury after practicing fully Friday, but was limited Saturday to earn the questionable tag. The 25-year-old still appears on track to play Monday given he still practiced in some capacity, but remains in danger of missing his second straight game. Madden (chest) was a full participant in Friday's practice, John Boyle of the Seahawks' official site reports. Analysis: Barring a setback, Madden will be ready to roll for Monday's game versus the Vikings. Madden spends a majority of the time on special teams and is mainly used on offense as a blocker in short-yardage situations. Madden (chest) is inactive for Sunday's game against the 49ers. Analysis: Madden was unable to practice at any point this week, making it an easy decision for the Seahawks to hold him out. Given that Madden is the only fullback on the roster, coach Pete Carroll may summon one of the team's offensive linemen or tight ends Nick Vannett and Ed Dickson to serve as a lead blocker out of the backfield in short-yardage scenarios. Madden (chest) is listed as doubtful for Sunday's game against the 49ers, Curtis Crabtree of Sports Radio 950 KJR Seattle reports. Analysis: Madden did not practice this week after suffering a sternum injury during last week's win over the Panthers. The fullback appears on track to also sit out Sunday's tilt against the 49ers, and a timetable for Madden's recovery remains undisclosed. Madden was diagnosed with a sternum injury after getting hurt in Sunday's 30-27 win over the Panthers, Bob Condotta of The Seattle Times reports. Analysis: It was initially reported that the fullback had injured his shoulder when he exited Sunday, but coach Pete Carroll provided more clarity on the source of Madden's pain after meeting with the media Monday. The severity of Madden's issue isn't known, though his participation -- or lack thereof -- in practices Wednesday through Friday should provide a clearer picture of his status for the Week 13 matchup with the 49ers. Madden is questionable to return to Sunday's game against the Panthers with a shoulder injury, Gregg Bell of The News Tribune reports. Analysis: Madden is used primarily as a blocker with just three carries all season, but his absence could have a slight impact on the Seahawks' running game if he's held out for the remainder of the second half. Madden (calf) returned to practice Wednesday, Bob Condotta of The Seattle Times reports. Analysis: Madden has resided on injured reserve since early November and isn't eligible to play Sunday against the Cardinals. However, the Seahawks can activate one more player from IR this season and, if they make the playoffs, could bring Madden back to the 53-man roster as soon as next week. Madden (calf) was placed on injured reserve Tuesday. Analysis: Madden suffered the calf injury in Sunday's loss to the Redskins, and is done for the rest of the year as a result. Madden was the lone fullback on the team's roster this season, and it remains to be seen whether Seattle will move forward without one active. Madden is dealing with a serious calf injury per coach Pete Carroll, Michael-Shawn Dugar of SeattlePI.com reports. Analysis: It's unclear how severe the injury is, but based on the comments from the Seahawks coach it doesn't seem too enlightening at the moment. Seattle should make a decision on his short-term future in the coming days. If he is shut down temporarily, the Seahawks may look to bring in a new fullback elsewhere. Madden injured his Achilles and is questionable to return to Sunday's game against the Redskins, John Boyle of the Seahawks' official site reports. Analysis: The 24-year-old was coming off a season-high offensive snap count in Week 8, and two straight games with one target. He had seen most of his playing time on special teams, however. 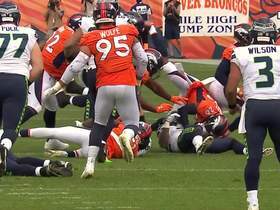 Denver Broncos outside linebacker Von Miller rips the ball from Seattle Seahawks running back Chris Carson for a fumble recovery. 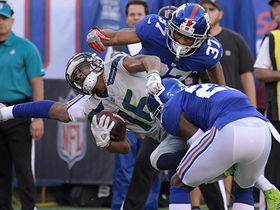 New York Giants stop the Seattle Seahawks goal-line plays ten times in a row.